Recently, in the Philippines, ShelterBox and Rotary have taken this partnership to the next level. ShelterBox has responded in the Philippines on twenty-five separate occasions. We are always looking for ways to innovate and improve our responses. One way to innovate our responses in the Philippines was to set up ShelterBox Operations Philippines as an in-country organization with aid stored locally so that we can respond more effectively. ShelterBox Operations Philippines, a locally registered ShelterBox office was set up with a plan to create a network of local Rotarian Coordinators. In this way, when a disaster hits in the Philippines our response can begin almost immediately. When Tropical Storm Urduja hit the Philippines it caused flash flooding, landslides and destruction. The Rotary Club of Biliran Island started their response shortly after the storm passed providing food, water, and health kits. 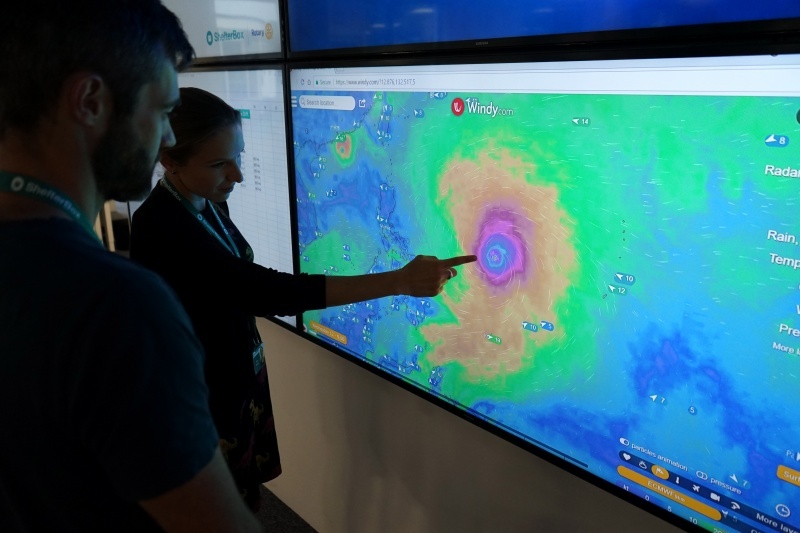 They were quickly in contact with the Local Coordinators who “coordinated with HQ Operations and the in-country Response team, who then started the ShelterBox Operations Philippines response”. As families were sleeping in crowded schools and public buildings, without adequate space, privacy or supplies, having immediate emergency shelter was very important. Fifty-seven families were provided with ShelterBox tents as well as blankets, mosquito nets, solar lights, kitchen sets, tool kits, water carriers and more. A further nine-hundred families received ShelterKits to start rebuilding their homes as well as blankets, solar lights, mosquito nets, and water carriers. The Rotary Club of Biliran Island was instrumental in the distribution of this vital aid, as their local knowledge insured ShelterBox could reach the most remote and most vulnerable families. While this alone is a great example of how effective the partnership between ShelterBox and Rotary can be at immediately responding to disasters with high quality emergency shelter aid, on this response, we were able to take the partnership one step further. The Village Project run by the Rotary Club of Biliran Island involved legally procuring land, construction of sixty transitional shelters, hands on training, and legal ownership documentation for families receiving the homes. Families were provided with technical training through TESDA (Technical Education and Skills Development Authority) to build their homes. In this way, not only will they have a safe place to live, but they also will have accredited training and a certificate which can help them gain employment in construction. The Rotary Club of Biliran Island helped secure the land, and provided the funding for the materials. ShelterBox was able to provide the roofing sheets for one of the Rotary Village sites, further strengthening our partnership while helping families recover. Disaster recovery is a process. When ShelterBox and Rotary work together after disasters, having ShelterBox’s technical expertise, and Rotary’s community connections and knowledge side by side, mean that families are given the best tools and support that they need through each step of the process to recover and rebuild. Also known as Ompong in the Philippines, Typhoon Mangkhut ripped through the Philippines’ main island of Luzon on September 15, 2018 as a category 5 typhoon. Its high winds and torrential rains damaged almost all buildings in the city of Tuguegarao. On landfall, sustained wind speeds of 200 km/h, gusting 285 km/h, were recorded, along with a storm surge of 3-4 m. The weather system was almost 900 km in diameter. A ShelterBox team was on the ground helping families who have lost everything. We have supported 1,042 families in total across three areas in the north. Distributions are now complete. Thanks to our partnership with Rotary and ShelterBox Operations Philippines, this was one of the fastest responses we have had to date.